I caught this crash at the start of the AMA Daytona SportBike race on Saturday, in turn two, that ultimately took Ben Thompson, Sahar Zvik, Josh Galster and Jamie LeBlanc out of the race. 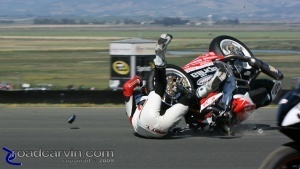 I'm not sure how it all started but I captured Ben Thompson's wild crash in this photographic sequence. 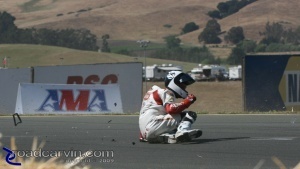 Ben Thompson's crash at the start of Race #1. About to go for a tumble. That's gonna leave a mark. Oh... look! It did... on the track, anyway. Gas spewing and parts flying. 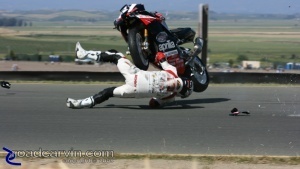 Not the type of flying Ben Thompson had in mind. 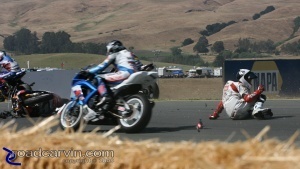 A scary moment for Ricky Parker as he tries to avoid Ben Thompson's Aprilia RSV100R. 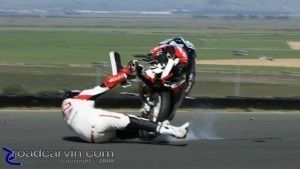 On the ground... now the trick is to avoid being hit by the oncoming riders. 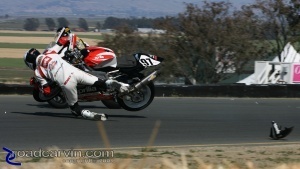 Sliding to a stop, happy to be in better shape than his Aprilia RSV1000. 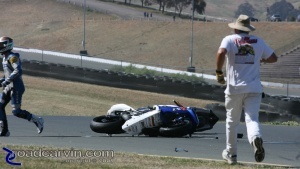 Unfortunately, Sahar Zvik crashed his Yamaha YZF-R6 into Ben Thompson's Aprilia RSV100R. Author: Dwight Domonkos /// submitted on May 18, 2009 - 7:37pm. 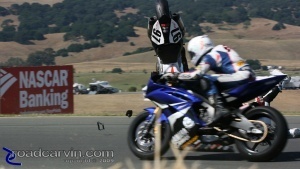 Ben Bostrom looking good on his Graves Yamaha.